jomuehlbauer had the most liked content! Hey guys, just moved down to New Orleans for work, should only be a few months. Anyone in the area? I'm in uptown with no driveway and its driving me nuts! Whose got a driveway / shade / hose I can use to wash my truck? I'll bring the beer! Be nice to meet some people outside of work too. Long shot, but looking for a 2014 1500 Denali grill. Willing to buy or trade my factory SLT grill. Dumb question maybe.. whats a flapper valve? They are all white. Mine doesn't match. Wish it did! Just installed, 2.25" ready lift leveling kit, trying to decide which tires I want now.. Parking Lights - LED Switchbacks? Has anyone with a 2014 Sierra tried installing switchbacks in their truck yet? I did a quick search of the forum and didn't find anything, sorry if this has already been posted. I don't know anything about these besides I really want them. These may not be the ones I'd get, but here is an example. http://store.ijdmtoy.com/Switchback-7443-LED-Corner-Blinker-Signal-Lights-p/led_dc_7443_sku38.htm The only concern is the lens in the parking light, I've seen other people with different trucks take the headlight apart to remove the amber lens, so I'm wondering if thats a possibility as well. Any ideas? Thanks! Counting down the days (well probably months) until I can tow my boat. Going to be awhile up here in MN. From the sound of it I shouldn't have any problems pulling it, weighs around 5,200# w/ trailer. Will do! Thanks for the link! I'll follow up after work tonight if it works or not. For the second time now in my Sierra (w/ navigation) I'm not able to hear any sound when I use my XM radio. The XM is working, because it shows the artist / song when I flip through the stations. First time the truck only had 96 miles on it, I was about to drive 1,200 miles with it to Colorado so I was a litte nervous. Luckily after 70 miles it came on. I tried turning it on and off and all the BS too. Nothing. Well now its not working again. Never had this issue with my 2014 5.3 Sierra. I have hiphop nation to listen too! Anyone else? 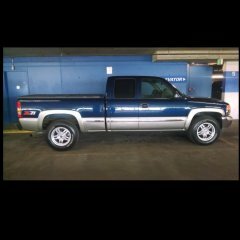 Z71 - Actual meaning? Additions? Differences? Finally got my 6.2! Same options as my old 2014 5.3 besides the 6.2 obviously, and SEY 22s, but no rear slide! Iridium, SLT, Heated/cooled jet black leather, sunroof, lane departure/collision alert, nav., 3:42s New and old There was no way I letting the dealer run it through their touch wash and grease it all up so its dirty in the first picture from transport, below is after I got it home and washed and waxed on my own. Mines on the train 235 miles away heading to VDC in Cottage Grove MN! 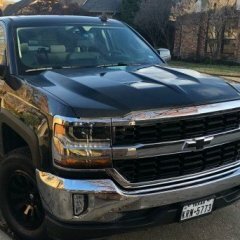 6.2L - 4WD - Crew Cab Standard Box - SLT - Iridium Metallic - Jet Black Leather (Heated/Cooled) - Sun Roof - SEY 22s - Loaded I haven't even seen/driven/herd a 6.2 in person so I am pretty excited Hopefully it isn't long now.. 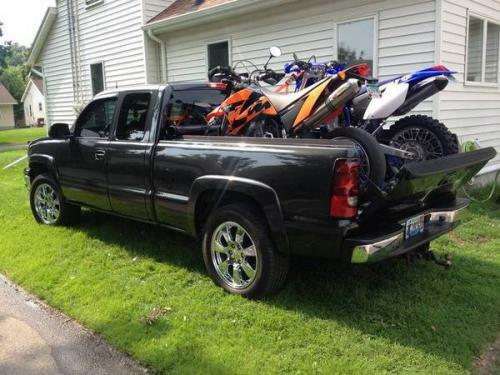 Missing summer and my old 2004 Silverado! Better see a video of this once its back! I've got over 10,000 miles on a 2014 5.3 w/ 3.42s (so I'd say I have a pretty good feel for it) and my 6.2 is in transit as we speak! Also with 3.42s.. I'll give a review between the two once I get it. Yea this is a really poor design.